Every time the delightful Bronte Law shows up in the college golf headlines - and it happens often - I can't help humming the song I Fought the Law and the Law Won. This Law wins often. Bronte, a junior at UCLA, won her fifth NCAA tournament last week at the Ping/ASU Invitational, beating the field by six strokes. She fired a 69 in the final round to finish with a tournament-record score of 12-under 2014. (It was Law's second win of the 2015-16 season, the first coming at the Stanford Intercollegiate.) And for her effort she was named UCLA's Student-Athlete of the Week. Accolades are plenty for Bronte. For example, she's currently No. 1 in Golfweek's women's college rankings. And she's currently No. 4 in the World Amateur Golf Rankings. There's no doubt Law will earn All-America accolades after this season, just as she did last season - when she was also the Pac-12 Golfer of the Year. Bronte, from England, has extensive experience playing internationally for teams GB&I and Europe. She was a member of the 2012 GB&I Curtis Cup team, Europe's 2013 Junior Solheim Cup team and GB&I's 2014 Curtis Cup team. Assuming she remains an amateur, she'll be at this year's Curtis Cup, too. Bronte won the English Women's Amateur in 2014 and repeated in 2015. Last year she won it by a whopping 16 shots! And she's already played in several professional majors. Yep, you fight this Law, she usually wins. 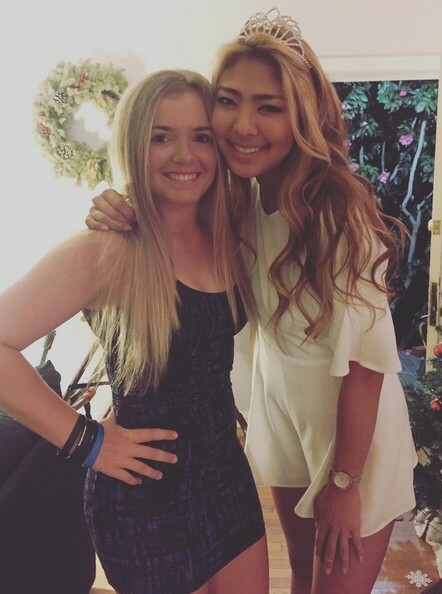 As for the photos: UCLA golfers clearly like to wear tiaras on their birthdays! Below, Bronte is with former teammates Ani Gulugian and Alison Lee.